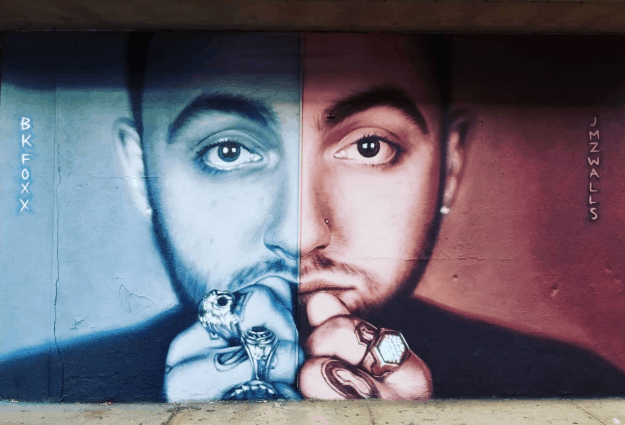 A poignant mural of the late Pittsburgh rapper Mac Miller has appeared in Brooklyn, New York. The dual-toned portrait is a collaboration between Venice artist BKFoxx and Bushwick collective JMZ Walls. The mural, titled “Filters” is tinted blue on it’s left side and red on it’s right, representing how some people may hide their struggles behind a fake exterior. MAC MILLER TRIBUTE MURAL ERSCHEINT IN BROOKLYN Der New Yorker Künstler @bkfoxx schloss sich mit dem Kollektiv @jmzwalls zusammen, um ein zweifarbiges Wandporträt von Miller zu erstellen. Die linke Seite des Stückes ist in einem blauen Farbton dargestellt, während die rechte Seite in Rot dargestellt ist. Miller was found dead on the 7th of September, 2018 inside his San Fernando Valley home from an accidental overdose at just 26 years old. The piece, which was finished in late January just after what would have been Miller’s 27th birthday, can be found at 1065 Broadway in Brooklyn.